Superheroes square off against a supervillain in a high-tech fantasy. 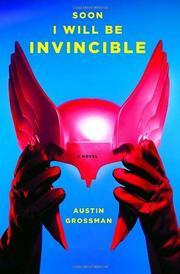 Get ready to be bombarded by superlatives as the world’s leading supervillain, Doctor Impossible, introduces himself. He’s “the smartest man in the world” even though, right now, he’s in prison in Chicago. He narrates alternate chapters: The other narrator is Fatale, a female cyborg newly inducted into the Champions, the current superheroes. The dual narrator device leads to some initial confusion, as Grossman does not attempt two different voices. It will not be long before the Doctor escapes and tries for the 13th time to conquer the world. His nemesis, dating back to their Harvard days as science students, is CoreFire, who has gone missing. The other superheroes are a mixed bunch. They include an old-school magician, a fairy from the 12th century and a former villain from the 35th century. Their preferred costumes are capes, cloaks and leotards, accessorized with the latest gadgetry, but they’re all dressed up with nowhere to go. As the Doctor gathers the four objects he needs for his doomsday machine, the superheroes spend their time yakking, recalling past exploits and indulging in flip commentary. Their history adds little to the storyline. There are only two action scenes. The first confrontation occurs past the novel’s midpoint, in the aftermath of CoreFire’s memorial service (there’s a mystery as to who killed him). The Doctor attends the service without his habitual disguise. The legendary Blackwolf spots him, and they fight in the sewers of Manhattan; the Doctor escapes in a submarine. The second, climactic confrontation, as the Doctor is about to inaugurate a new Ice Age, is equally unimpressive, interrupted by more talk as the fairy describes her origins; the battle seesaws in an arbitrary fashion. For all the special effects, a debut novel that’s lifeless and inert. by Joseph D. Carriker Jr.